Does anyone else think it a bit strange that a device used to torture and execute prisoners has become THE icon representing a major religion? The Roman empire probably executed thousands, if not millions, of people by nailing them to a cross and torturing them until they died. Every one of those executions was a terribly traumatic event for the victim, and each victim would have suffered just as much, if not more, than Christ did during his execution. 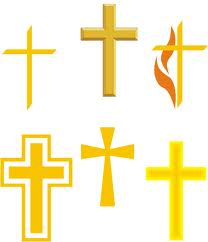 Just another thing about Christians that I can’s quite understand . . .
. . . it seems to me that a happier, or at least a less gruesome icon, would be more appropriate for a religion. This entry was posted in Miscellaneous Musings and tagged Christian cross, Christian icons, Christians, icon, religious icon. Bookmark the permalink. Or even worse, if he was tortured sexually!!!!!! Can you imagine people wearing dildos on their necks? Dildos dangling from the neck of fumblementalists – – now, there’s an interesting picture! It just symbolizes Christian love. You’re not suggesting replacing it with an Easter bunny are you? That would leave the wrong impression about love.